Deleting a design permanently removes it from the Page Designs pane. All associated discussion topics and annotations are also deleted. A deleted design cannot be recovered. Therefore, you should be confident that you won’t lose important information. If you want to hide a design from Reviewers, you can change its visibility instead. 3. Select the design to be deleted. Delete the design by selecting Delete Design from the File menu or from the right-click context menu, or by using the keyboard shortcut. Note that this operation cannot be undone. 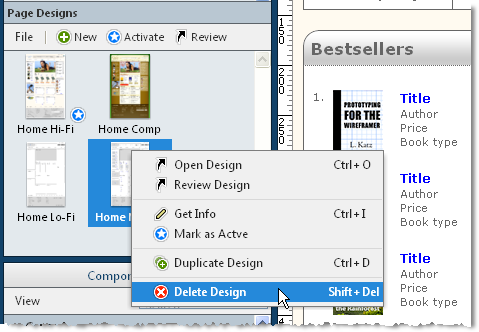 As shown below, you can delete a design using the right-click context menu.